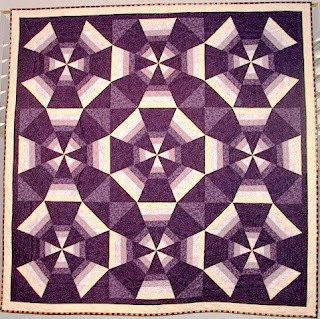 Elaine also asked about the quilt that I made with it, which I may never have posted, so here it is. I'd have liked a scrappier version like Elaine's, but this was a class sample so I just bought a bunch of fabric for it. The colors in the photo are not accurate. It is more of a soft purple (think lilac) with soft yellows and pinks. These are easy, fun, and an excellent stash-buster, much better if not so matchy-matchy, in my opinion. Very, very nice and I love that binding. I saw Elaine's quilt too, and I think they're both great. Makes me want to try one too. I try not to buy too many specialty rulers if I can make due with something else I already have, but this one would be worth it.